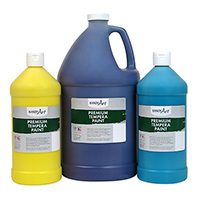 Handy Art® Premium Tempera is made with an exceptionally high pigment load. These brilliant colors provide the ultimate in opacity and coverage and dry to a matte finish that won't chip, flake or crack. Available in 12 brilliant colors, use our Handy Art® Tempera Gloss Medium to expand the versatility! Handy Art® Premium Temperas are certified AP non-toxic.